At the Depew One Stop on Broadway, where he buys cigars and his favorite instant lottery tickets, the clerk accidentally handed Jerry an extra $20 instant ticket. Jerry returned the ticket and went outside to scratch the other tickets he had bought. But when he won small amounts 7 times in a row, he decided to ride his lucky streak. He went back to the store and asked for the same ticket he had earlier returned, and won big time. 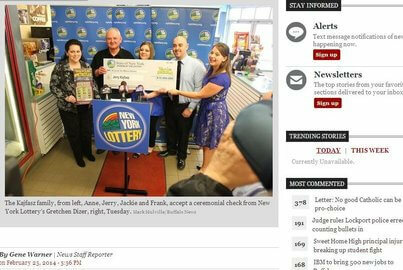 Jerry had the ticket registered in his son’s name and has said he and his wife will take 86% of the winnings. The couple will net $300,000 per year after taxes, for the next nineteen years. Their two children will each get a 7% share.